Hey! This is Amber from Crazy Little Projects happy to be over here at my cousin Sarah’s blog (did you know we’re cousins?) sharing something fun and summery! A S’mores Ice Cream Cake Recipe! Sarah’s obsessed with S’mores (did you catch on to that yet?) and I’ve got to say, I’ve got a weak spot for them too, so today I’m showing you a S’mores Ice Cream Cake! Hot fudge, marshmallows, graham crackers, ice cream….how could you go wrong? Want to make it? 2 tubs of ice cream (half gallon size) in your two choices of flavors. I found 2 different S’mores Ice cream flavors at the store. Just find anything that screams S’mores to you. First, take your ice cream out of the freezer to let it thaw while you do the rest of this. Then put it all back in the freezer to harden again. Once it is hard again, pop the two pieces out of the pan and peel the foil off. Warm up your marshmallow fluff in the microwave (watch out, it expands a TON when it gets hot) and drizzle it on top. Do the same with the left over hot fudge. Sprinkle with mini marshmallows too. Stick it back in the freezer until you are ready to serve. When you ARE ready to serve, take it out for a few minutes to thaw before cutting. If it is hard to cut, heat the knife under hot water first. And join me on Pinterest, Facebook, and Subscribe to my blog! Take your ice cream out of the freezer to let it thaw while you do the rest of the recipe. 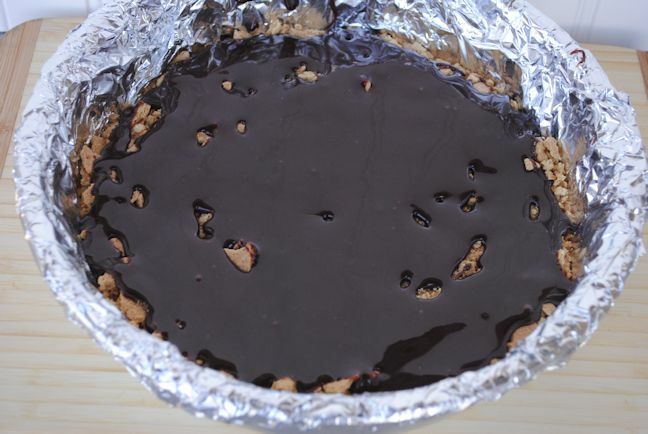 Line 2 round cake pans with foil. 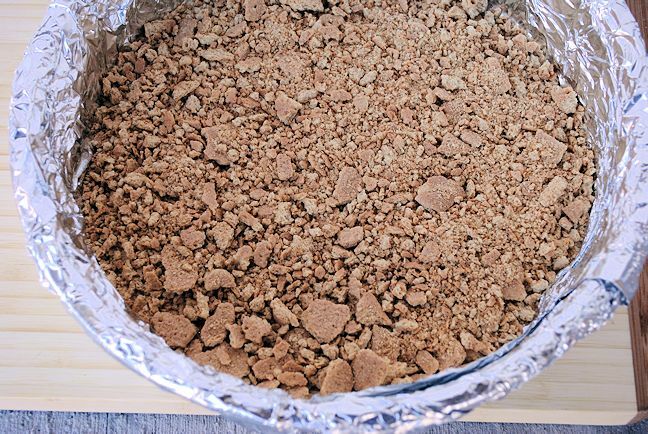 Crush your graham crackers and pour them evenly in the bottom of the two pans. Warm up your hot fudge a little and pour 1 cup of hot fudge in each pan. Once your ice cream is mushy, spread it in the pan. Smooth the ice cream out on top with a spoon or spatula. Put the pans back in the freezer to allow the ice cream to harden again. 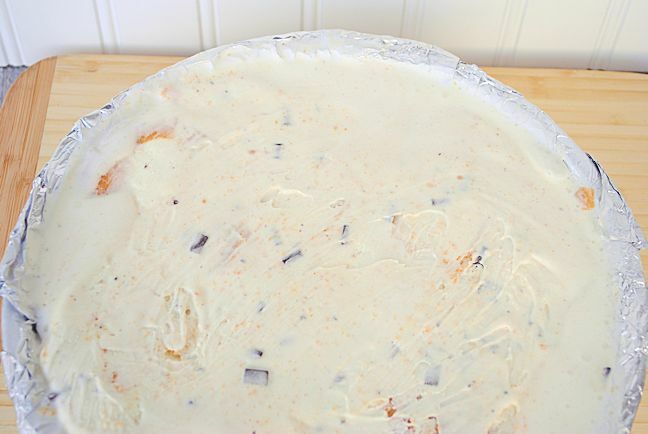 Once the ice cream is hard again, pop the two pieces out of the pan and peel the foil off. Warm up your marshmallow fluff in the microwave (watch out, it expands a TON when it gets hot) and drizzle it on top. Do the same with the left over hot fudge. Sprinkle with mini marshmallows. Be sure to check out the rest of the recipes in the S’mores Saturdays series! Only two weeks left! Waaaaah. But all good things must come to an end. And then I get to start prepping for my favorite season: HALLOWEEN!! Eek! 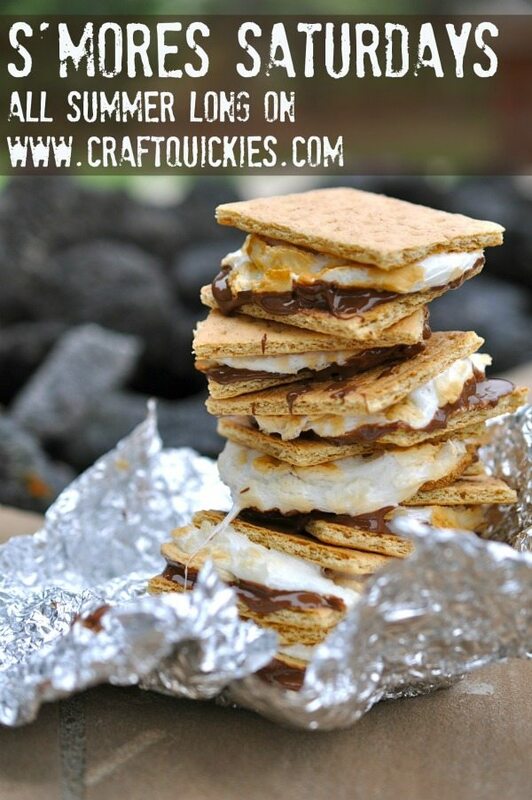 Find more yummy s’mores ideas on my Pinterest board, S’mores Recipes! This looks heavenly. Thank you for sharing at Dishing it and Digging it link party. If I only I could make this appear immediately on my counter! Guess I’ll have to go the old school route and make it.